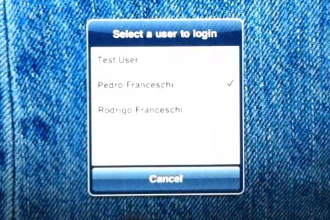 Apple’s (s aapl) iPad doesn’t natively support multiple user accounts, which in a family setting could cause problems. Installed apps, background images or other customizations, web browsing and search history, to name just a few data points, aren’t tied to a specific person, for example. That can bring havoc to application recommendation engines or in-game progress. Developer Peter Franceschi’s iUsers solution for jailbroken iPads, by way of Engadget, shows promise for single iPad households: IUsers brings support for multiple iPad profiles, allowing each user to customize her own experience on the device. The system works by making copies of files Filesystem iOS, and some internal modifications of the system to maintain internal data and native applications downloaded from the App Store. What is maintained for each user is the application data and preferences of the iPad. What files are not maintained and synchronized music and videos from iTunes, but I’m working on a update for this to be supported. Although rough around the edges at times, Franceschi’s effort shows polish too. There’s a lock-screen button to switch user accounts. A settings pane allows for editing the account information for each person or adding new user accounts, plus there’s a small switch to enable administrator access. Unfortunately, iUsers or any other multiuser solutions similar to it are likely to be unofficial modifications found in the Cydia application store. Apple has no incentive to bake in this type of functionality into iOS, and instead it would prefer that folks who want an iPad simply purchase their own. The simplicity of one iPad per user or iTunes account is certainly something I appreciate. It makes the tablet a highly personal device, much like a smartphone. But I see the other side of the coin as well. As my kids pick up the iPad every now and again, I see my Game Center achievements slowly climb, for example. (Not that I don’t appreciate the help, but I’d rather earn them myself!) The App Store Genius has been faked out and is now recommending apps targeted for the younger crowd due to the apps installed by the kids. And I’ve lost count of how many times I went to Facebook in Safari on my iPad and started a status update, realizing only in the nick in time that I was signed in to my son’s Facebook account. Again, I can appreciate why Apple isn’t likely to enable multiple user support on the iPad, but digital worlds are colliding on my tablet. For now, it looks like jailbreaking and a solution like iUsers might be the only recourse. Or do you think Apple should reconsider its stance on the lack of user accounts for the iPad? No, they would prefer you bought one each! Thanks for the comments about space. I am getting an iPad to share with my wife and we both like our own settings. I don’t think space will be an issue initially, but good to know! Does anybody knows that Franceschi is 14 years old brazilian boy?… Oh, yes, he is. Pedro Franceschi, find him at Google. If you bought a 16GB iPad, and share it with one person, you essentially now have a 8GB iPad. No thanks.